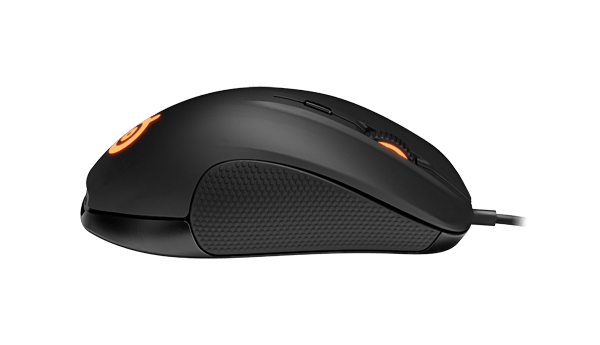 This is a totally new shape and design from Steelseries, this is also a non-ambidextrous mouse. Many of you are probably familiar with the Sensei and Kinzu series of mice that have had a very long life with a number of revisions and re-branding for games and gaming teams. 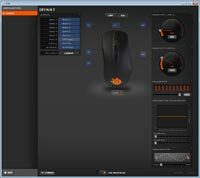 The designers of the Rival have also added an interesting feature that allows you to personalise your mouse one step further than before. They have added a 3D rubber name plate, which if you are lucky enough to have or know someone with a 3D printer you could make your own. They haven't released the CAD file for the name plate yet, but i'm sure this will lead to a few interesting customisations. I was hoping that the name plate was going to have the ability to be back lit, but this is not to be. I would of liked the option to have a name plate to be transparent and have the same colour as the logo shining through. The shape looks a bit odd through the plastic cover of the packaging, but once you get to hold it its feels almost relaxing Perhaps that sounds odd in itself - but the shape really has a natural and pleasant comforting feel. 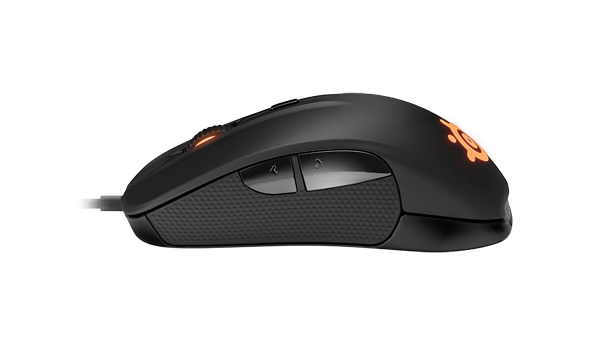 The rubber side grips with their knobby texture run from almost the front of the mouse to 2 thirds down the sides and give excellent grip. Â The two side buttons are placed well, with the back button being almost three times the size of the forward. This seems to work well with any grip style. There is a small divide between both buttons making it very easy to feel your way to the correct button without thinking. The scroll wheel has a very solid feel with no play left or right. The notches in scrolling have a very clean feel without hindering the scroll. Clicking the scroll wheel requires a bit more pressure. 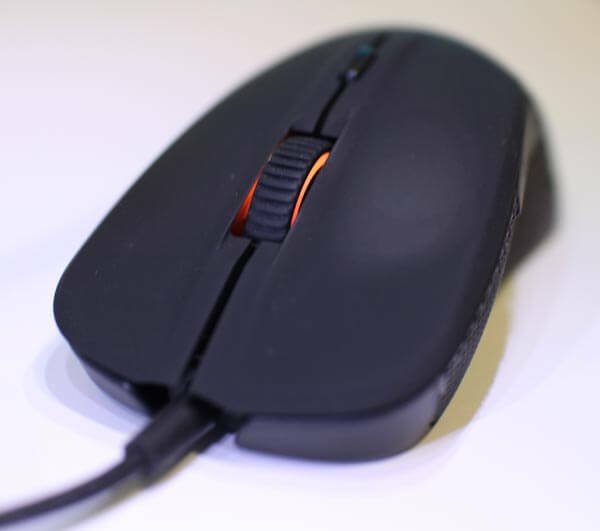 the rubber coating on the scroll wheel has a soft feel and runs from one side to the other. The rubber coating has a nice clean and well defined pattern that lends itself to gripping. 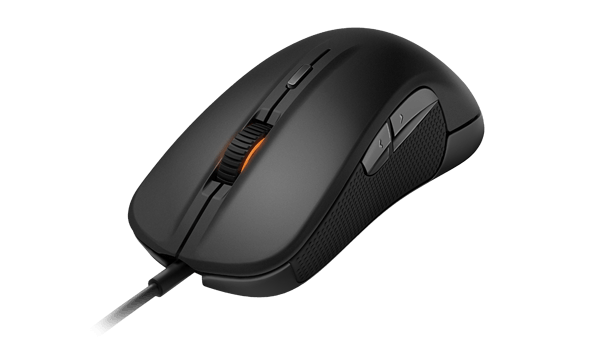 One thing that was disappointing was the cabling, a plastic/rubberised cable which I find a bit out of place with what Steelseries has done on just about all of their recent mice, even the Kinzu v2 has a braided cable. 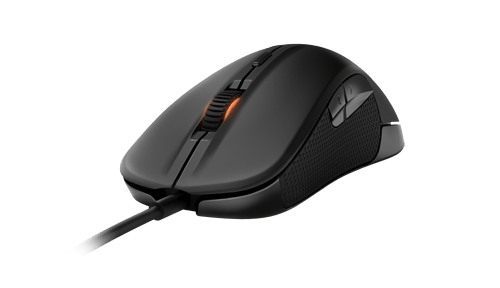 Like many of the Steelseries products there is a weight to this mouse, a certain feeling of quality. I do think the rubber molded grips are going to be a pain to clean in the summer months, but that's a small sacrifice for the control they offer. With the lighting it is hard to get the same colour that you pick from the software. 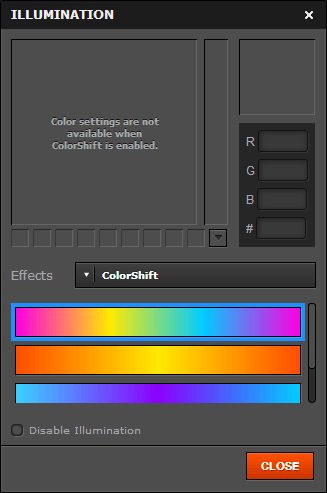 For example, if I tried to set the colour to pink in the software I would get a soft blue. For all the primary colours the lighting does a great job. With the soft touch coating it has started to change texture where I come into contact with it. This i'm not too sure to make of, the feel is the same as when it was straight out of the package. It does illustrate very well how I hold the mouse. The Rival has been a great experience, so much so i'm thinking about making it my daily driver. When I do the reviews I leave my daily driver plugged in (my Naga Epic), I quite often gravitate back to it throughout the week. The Rival has performed so well that I have hardly touch it. The clicks of the buttons are really good, they do sound different, a softer and less sharp "click" sound. Every click has registered without a hint of delay. I'm using the stock 1000Hz polling and it feels very responsive. The sensor has done a fantastic job of reading off my dirty mouse mat. Its performed as well as the laser sensor in the Epic. I have tried to up the CPI but couldn't live with such a speedy mouse pointer. The relatively small mouse feet have survived without getting any scratches, and are very effective for their size. 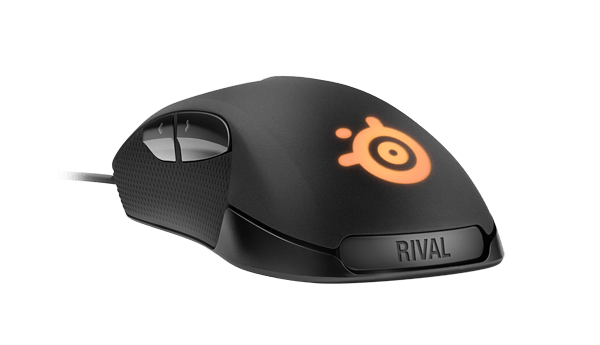 This is a bit of a no brainer after a week of use for me, i'm pretty sure that i'm going to keep using the Rival in some capacity once i'm done with the review. After all I did spend my money on it. The biggest win for me is the comfort of the mouse. It has all the features you will ever need from a mouse, with excellent software. 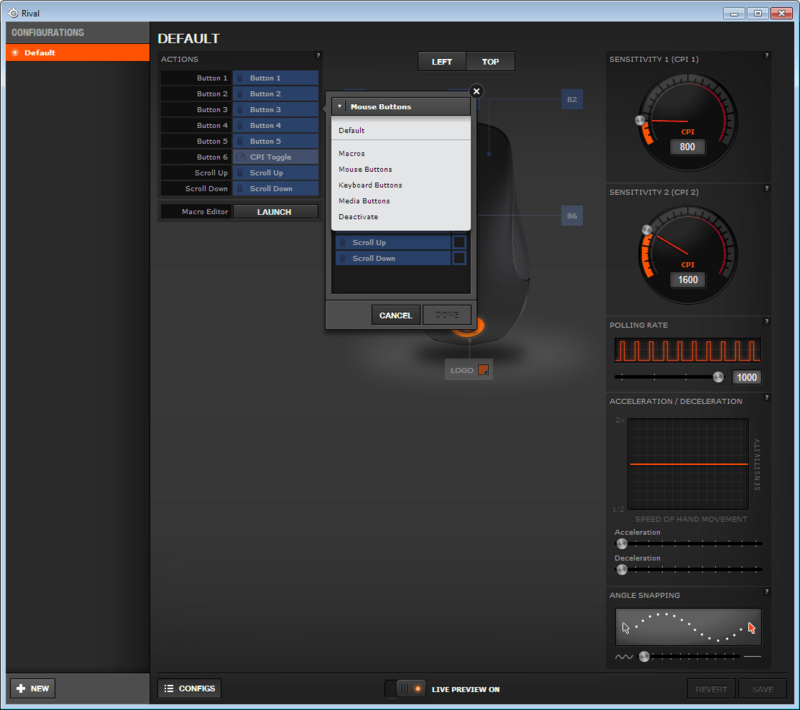 This is the first Steelseries product that i have that utilizes the new Steelseries Engine 3. I wasn't sure what to expect after downloading and installing the newer software. The older versions seemed pretty sold from my previous exposure. The Engine 3 supports Windows XP and up, as well as Mac OSX 10.78 and up. 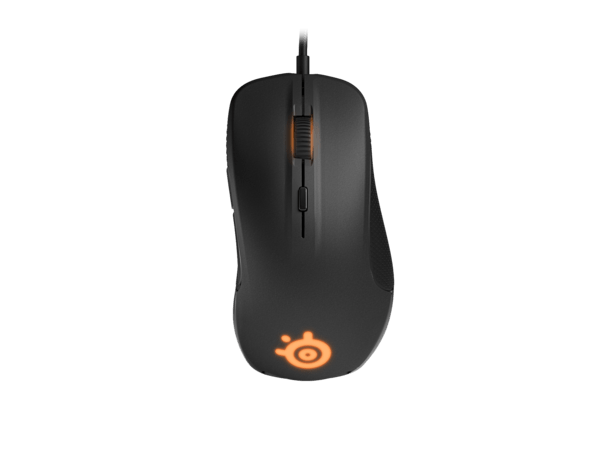 I think Steelseries will have to address the linux community. With Steam Machines on the way i'm sure many gamers will want to play with one and see what it can do. I'm expecting to see a wave of press releases from peripheral makers announcing support for steam machines, which would also bring support linux. The Engine 3 software download page states "no account required"... I wonder who they could be referring to here. Either way the software is a fraction smaller than the older Engine 2 download, coming in at 43.8MB (version 3.1.3). During my week of use, there was an update released for Engine 3. The update was easy to download and run, during the installation of the update I didn't experience any freezing of the mouse or other peripherals. The update (version 3.1.4) addressed some bug fixes, no specific details where in the release notes. 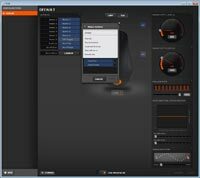 It appears that Steelseries are taking the drivers and updates seriously as there have been a number of updates throughout December. Installation is quick and painless, with no restart required. Once it starts up you see the first of many changes. In the old Engine 2 you would have a window with the devices listed down the side and the centre panel for configuration. Engine 3 starts off by showing you a list of connected devices. 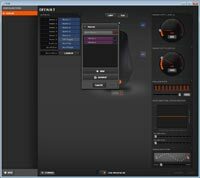 I did try plugging in another Steelseries device that is not specifically supported by Engine 3, and sadly it was not detected. This could be a pain if you are unlucky to have a new mouse and say something like a Apex keyboard. You would be required to run both versions (Engine 2 and Engine 3) at the same ti'me to manage both devices. 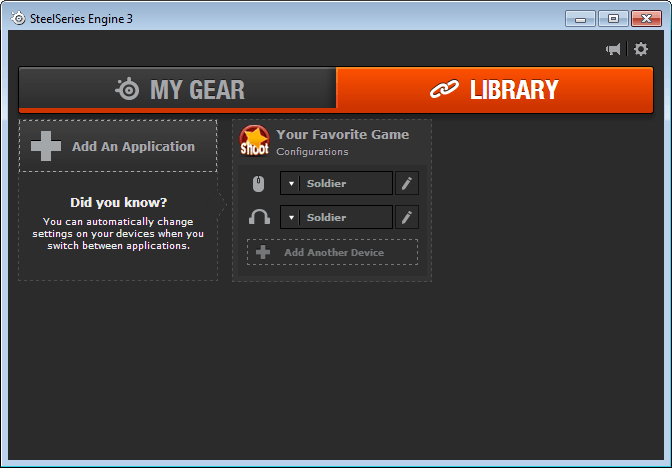 The library tab on this first screen allows you to group your profiles for specific games and applications. 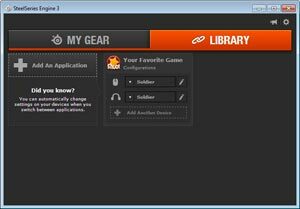 By default the Engine 3 software will switch profile automatically if it detects you are playing a game or using an application that you have defined a profile for. I did notice that there is no way to import or export your profiles. I hope they address this, as i'm sure there are enough people out there that have multiple systems and would want a way to copy or even back up their custom profiles. It could also be a nice thing if some of the sponsored teams or players release custom mappings. 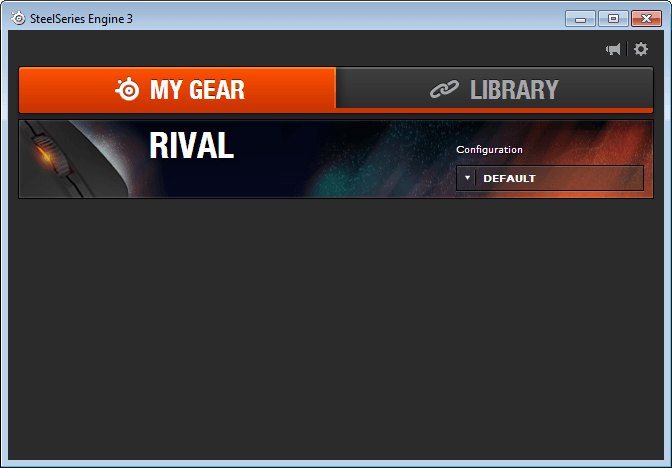 By clicking on the Rival option under "MY GEAR" you can access all the setting and customisation options for your device. As you can see all the main settings are accessible from one screen making it much easier and faster to access what you want. As well as adding and changing profiles. For each profile you can edit the two CPI setting, the polling rate, Acceleration and Deceleration and the angle snapping. The most interesting one to experiment with is the Acceleration and Deceleration. 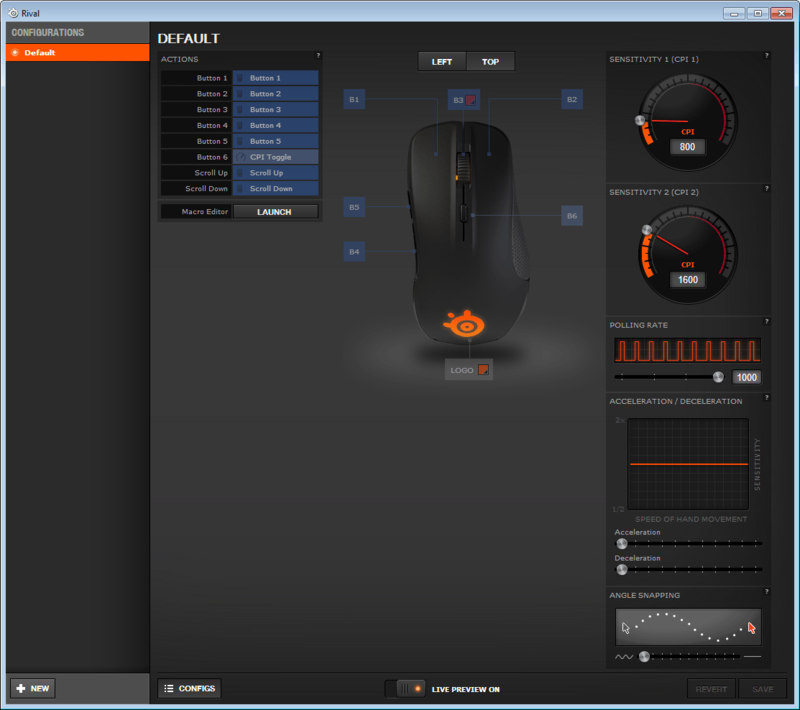 As you can manipulate the way the input of the mouse behaves when you start and stop moving the mouse. 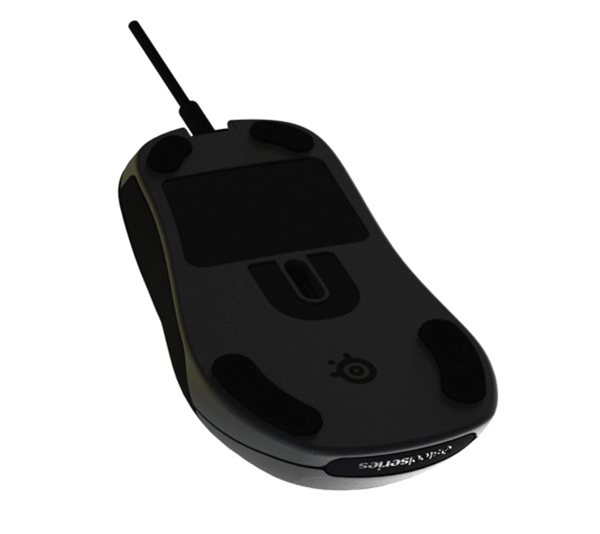 Simply by clicking any of the labelled buttons or features on the mouse you are presented with all the options that are possible. As you can see in the screen grab below, clicking on button 3 (B3) i'm able to change the default action to any number of things, including assigning a macro. 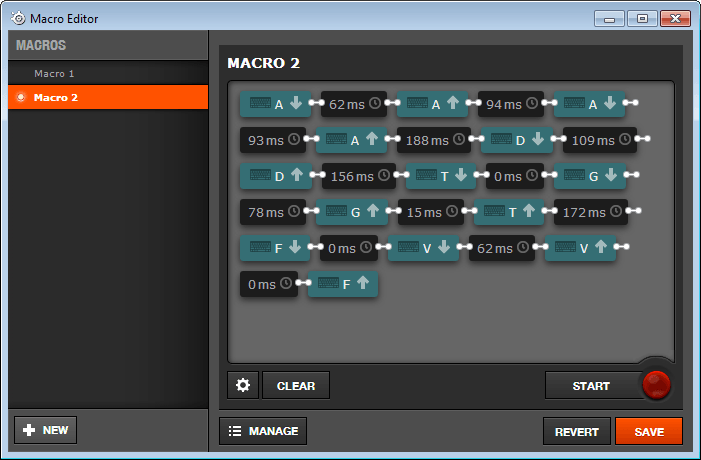 You can also directly launch and record your macros from here as well. 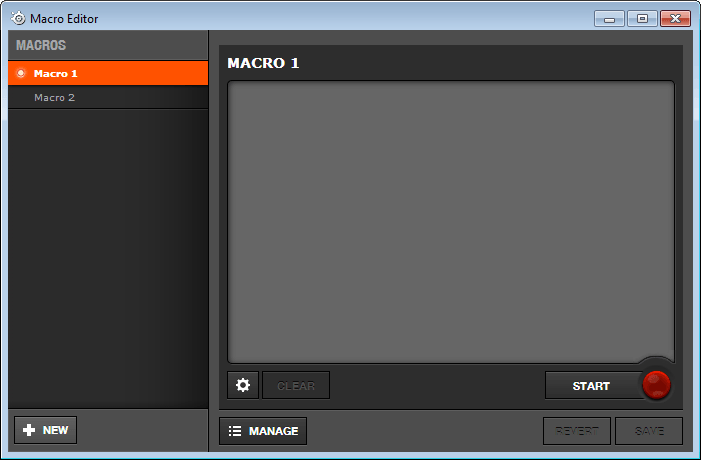 The macro editor looks very plain and simple, until you actually start recording and changing options. You have options for recording delays, either a predefined delay for each action (by default 15ms, but can be changed), No delay or the delay As recorded when you press the combinations. 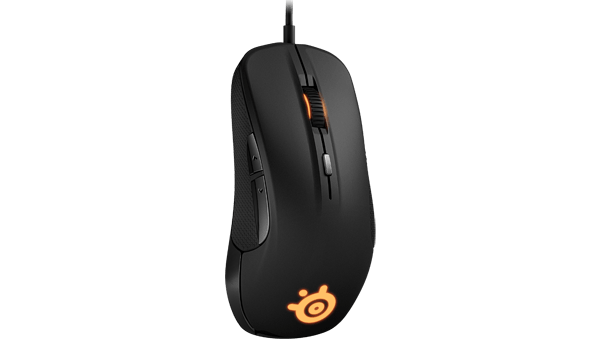 You can change the colour of the two lighting zones: the scroll wheel and the Steelseries logo. 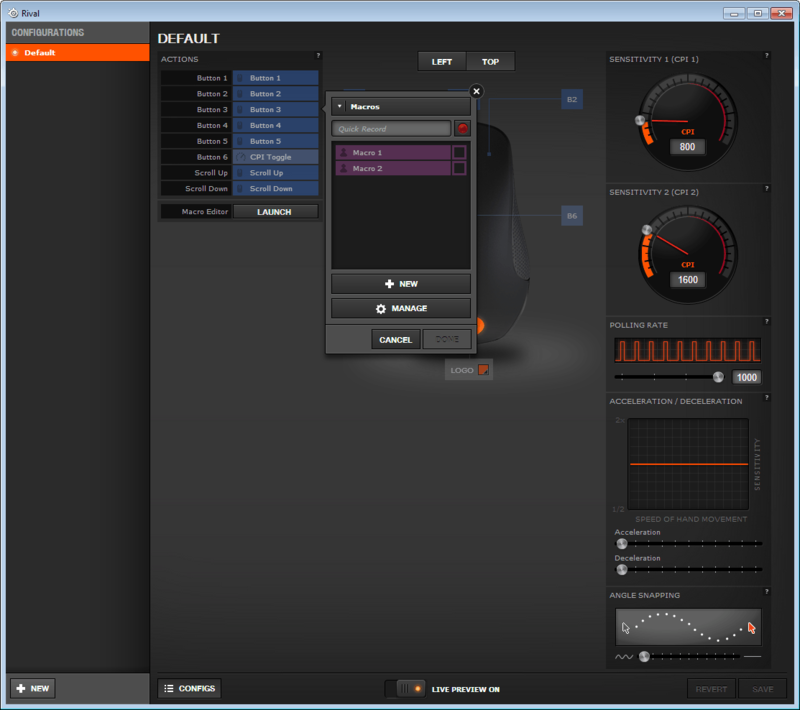 As I mentioned previously the colour you pick in the configuration software is not reflected accurately on the mouse. 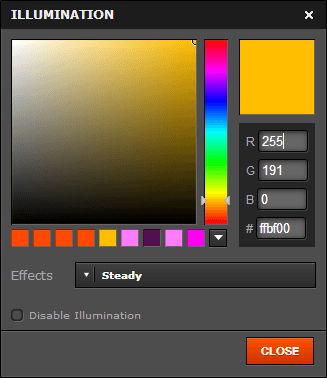 They have added the neat option of entering in a HEX colour value, as well as the individual RGB values. 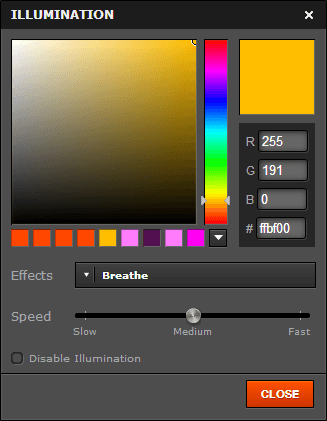 You can also change the effect for the lighting zone: Steady, Breathing and ColorShift.